If you’re trying to connect an Instagram account using the “Business” option but some of the Instagram Business accounts are not listed then this is usually caused by previously selecting to only allow the app to access certain pages that you manage. 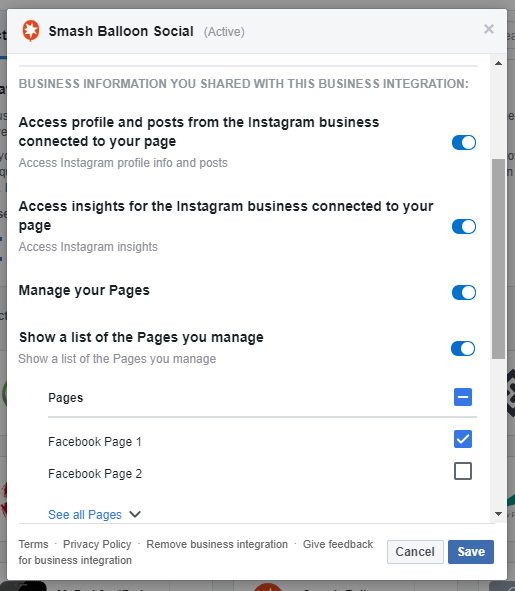 1) Log into the Facebook account which manages the Facebook Page connected to the Instagram Business Profile. 4) Find the app labeled “Smash Balloon Social” and click “View and edit”. 5) You can then select which of your Facebook pages you would like the plugin to be able to access. Alternatively, you can disable the “Manage your Pages” option, and then the plugin will prompt you to allow the plugin to access you pages again when you configure the plugin. 6) Return to the plugin’s Settings page and try connecting an Instagram account again.